Photo courtesy of the Ontario Provincial Police. 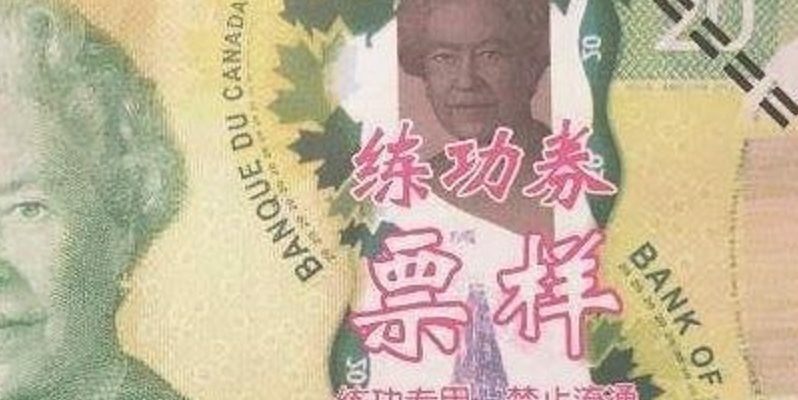 The Ontario Provincial Police is asking people to take a good look at their $20 bills. 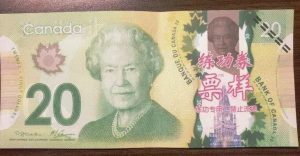 Several counterfeit bills have surfaced in Leamington recently. However, the tender is obviously fake if you look at it. There is a language, possibly Chinese, written in red lettering on the bills. Should you come across the bills, the Bank of Canada suggests you politely refuse to accept it, ask for another bill, and call local police. The person passing it to you could be another innocent victim. Making or passing counterfeit tender is a crime. If you have information about the fake bills, call the OPP at 1-888-310-1122 or Crime Stoppers at 1-800-222-8477. You can also report it online at www.catchcrooks.com.